Major apparel retailer in Fresno, California, looking to invest in new lighting to replace the existing commonly used dim fluorescents opts to use energy-efficient LED Lighting to create a more even distribution of light and give better clarity when reading labels on boxes. 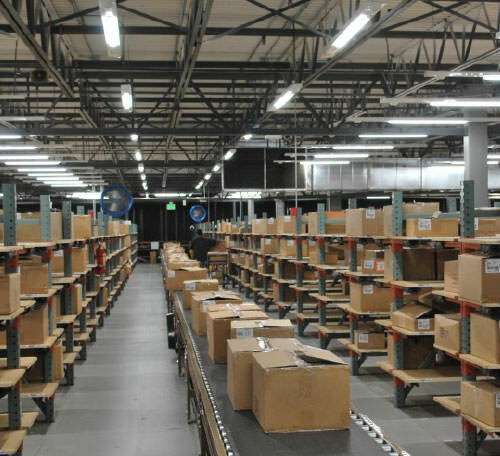 FSC Lighting’s L8500 series was chosen to replace the 112-watt fluorescent fixtures throughout the warehouse, slashing the operating cost of its entire distribution center while enhancing the visual appeal of their vertical racking. By replacing 112-watt fluorescent lamps with FSC’s 25 watt L8500 Series LED Strip, this major retailer will use 408,112 fewer kilowatt hours (kWh) per year, an annual savings of approximately $101,520. As an added benefit the L8500 LED fixtures qualified for a Tier 2 LEDA incentive of $122,000. Annual energy cost savings coupled with the substantial rebate guarantees a pay-back 1.3 years. Apparel retailer receives 75% baseline load reduction plus an additional 75% savings from occupancy sensor in both pick module and conveyor applications.